But in 1882, dry rot was discovered in the spire and after much deliberation contractors were engaged to dismantle and rebuild it. 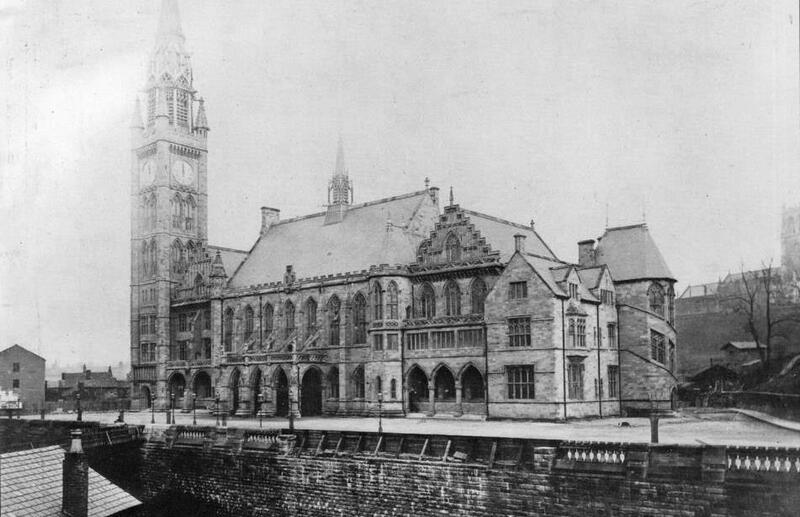 Whether by accident or by an attempt to speed up the process at 9:20pm on 10th April 1883 a fire was discovered in the Clock Tower. Chief Constable, Wilkinson sent a telegram to the fire-brigades in Oldham, Heywood and Milnrow to provide assistance. 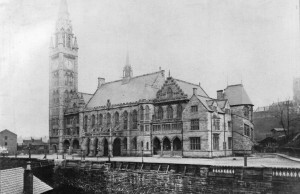 Although the Rochdale fire-brigade was based in the town hall (now the registry office) Oldham and Milnrow were first to start tackling the blaze. Oldham fire-brigade having arrived in 25 minutes were ready for action, but the Rochdale engine was forced to gallop round the town hall in order to draw enough air to get steam up to power their pumps. Meanwhile thousands of people gathered around the edges of the town hall square to observe the horrifying spectacle. 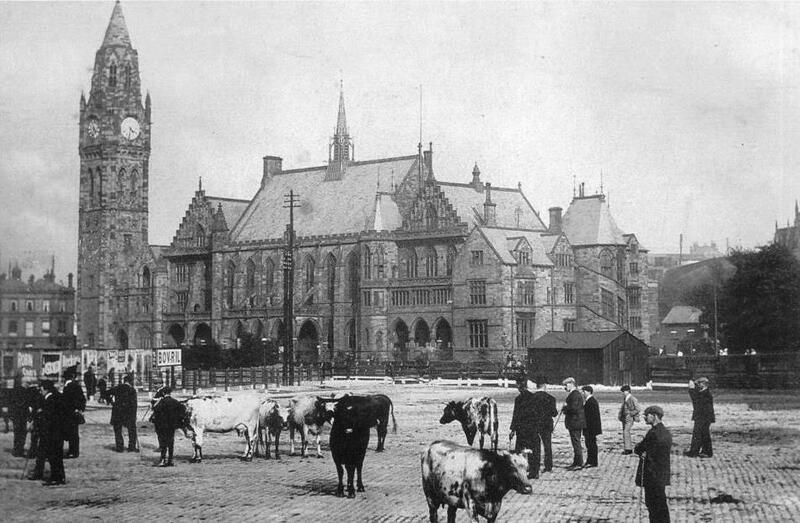 The gilding of the spire reflected the blood-red glow of the flames and the clock faces shone far brighter than the gas lamps that usually illuminated them. Occasionally could be heard a shout, or a scream of terror from some female, as fragments of burning material came to earth with a great thud. 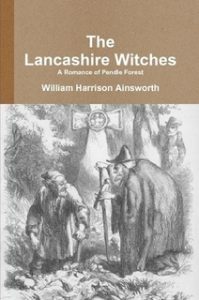 As the fire wrapped the tower in a deadly embrace streams of molten lead ran down from the spire and by half past ten the wood of the spire was consumed and the iron framework, having been heated to almost white-hot, gave way crashing to the ground at the rear of the town hall. With the town-clerk’s offices in imminent danger of destruction, the clerk, with Thomas Foy and another man. ran inside to rescue as many documents as they could. At the same time Alderman Taylor called upon one or two men to follow him, which they did unhesitatingly, and went up to the Free Library and began removing the paintings and books. As the spire crashed down a great rod from the spire made a large hole in the roof of the clerk’s office and large lumps of bell metal fell into the room. A similar scene unfolded in the library with large lumps of metal and debris raining down. Luckily none of the men were killed, but Police-constables Shaw and Schofield were badly burned by moulten lead, however despite this they were able to continue their duties. It took until one o’clock for the fire to be brought under control. Heywood fire-brigade arrived, (Having only just received the message as the local telegraph office closed at 8pm), only one or two slightly smoldering beams remained. The replacement clock tower and stone spire was designed by Alfred Waterhouse two years later and opened in 1888. It stands 15 yards from the site of the original tower. The rooms at the base of the original clock tower were preserved and still form part of the main body of the town hall.